The reception at the Terpenes and Terroir dinner at Healdsburg Shed. Photo: Marcia Gagliardi. © mymilligram. A couple weeks ago, I was invited to attend the North Coast Wine & Weed Symposium, now in its second year, at the Hyatt Regency Sonoma Wine Country in Santa Rosa. Over 500 guests attended a variety of panels and discussions all day, providing a closer look at the cannabis industry, updates on new rules and regulations, what’s next for California’s cannabis and wine industries, and how the two industries can work together and learn from each other. The focus was on how to be collaborative, and where are the opportunities and synergies, from product development to canna tourism. There were a variety of informative booths from sponsors (primarily in the cannabis industry), and while on-site consumption and sampling were not allowed, I did manage to score a shea butter-hemp salve (thanks, Kola Farms). #protip: Mondo also makes conferences extra-interesting—I love learning while a little elevated—and you'll make friends with it (say high), which is why you’ll always find a little tin in my purse. There were such highly (ha) qualified speakers, including opening remarks by CannaCraft CEO Bill Silver, whose company’s buzzed-about Hi-Fi Hops, the new cannabis-infused and hop-flavored “beer” created with Lagunitas (which is an alcohol-free tonic but has the mouthfeel of beer) was released just a few days before, and pretty much encapsulated a lot of what the symposium was about, in just one can. I particularly enjoyed seeing so many powerhouse women on stage, from cannabis attorneys to manufacturers to entrepreneurs. All eyes and ears were on the cannabis fempire as they were talking about legalities and distribution and trends. There were numerous facts and tidbits all day that piqued my interest, like this: ancillary businesses to cannabis offer so many opportunities for success for the next four–five years, including tech, legal, and packaging. Or to think about how statewide delivery would be the biggest game changer (uh-huh). And this stat was crazy: the value of an acre of wine grapes can range from $5K–$20K, while an acre of cannabis is more like $1.5M–$1.7M. Wowza. And just a little something to ponder: why don’t we talk about how different forms of alcohol makes us feel the way we talk about how different forms of cannabis make us feel? (No aggressive weed, ha-ha.) And what about the perception of people who drink wine to relax versus the perception of people who consume cannabis to relax—how is it different? Discuss. For me, some of the most fascinating information was about the cannabis consumer. Jessica Lukas, VP of BDS Analytics (based in Colorado) shared data they collect from dispensaries, and confirmed some of the things we've been hearing, like how flower is losing market share year after year. And then there are stats like how 75% of cannabis users consume for recreational and social use, while 52% use cannabis for health and medical reasons, but in both those groups, 42% use it to relax/be mellow, manage anxiety and stress, sleep better, and feel peaceful. It says a lot about the state of our world, doesn’t it? These stats tie into the importance for brands to make consistency a brand feature—if your consumers are using your brand for a particular mood, state, or effect, consistency is crucial, whether you’re a cannabis-infused beverage or a pharma-inspired spray (like an inhaler). Since we were at the Wine & Weed Symposium, it was interesting to look at numbers about how 72% of cannabis consumers also consume alcohol, and 53% see them as good for the same occasions (at least sometimes). But 54% also drink less when cannabis is present, while 29% drink the same amount. 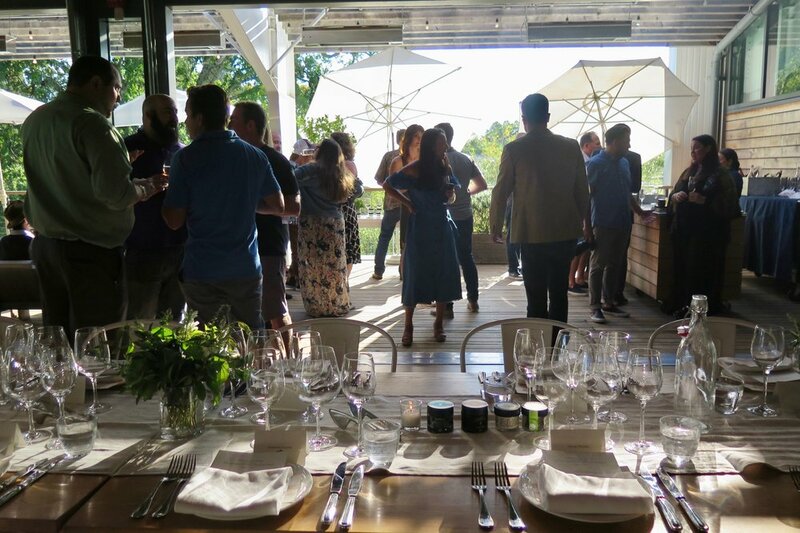 Cannabis and alcohol is a tricky area of crossover and cross-fading, as we know, and something everyone in the event space and hospitality realm will need to keep a close eye on, especially for the burgeoning canna tourism industry in wine country. Just today, Eaze announced delivery to Napa. Start low and go slow applies to cannabis consumption, and definitely when cannabis and alcohol are hanging out in the same (tasting) room. There was such a fantastic and fun crowd (so many growers in the house—and so much laughter! ), peak-of-season ingredients (burrata with plums, yes please! ), the finest cannabis (and products), elegant wines, education, and warm hospitality. We talked terps and terroir, sniffing bouquets of buds (from Flow Kana and Fiddler's Greens) and pinot noir. For dessert, we had non-psychoactive versions of the gelées and chocolates from Garden Society. The upstairs of Shed on a summer evening is so special, the perfect setting to celebrate the bounty of our beloved NorCal. At the symposium, the panel on canna tourism discussed the notion of how to create cannabis connoisseurship, but these ladies already keenly understand connoisseurship of both wine and cannabis, and how they relate to each other. You can take a look at some event pics and the players on Instagram here (be sure to follow our hosts on Insta for future events).